There’s no better feeling than putting your heart onto digital paper, uploading a Word file and have your book sold in the largest book store in the world. I’m in love with self-publishing. However, your Kindle looks like a dog’s dinner because of the crap that Microsoft Word inadvertently puts into it: colors in headings, inexplicable font changes, the bullet points coming out smaller than the body text, too big, too small, you name it. I’ve spend months pulling my hair out wrestling with this (I wasn’t bald before). Then I discovered how to get rid of Microsoft Word’s rubbish from an ePub with Sigil (free software) and Regular Expressions (a sequence of characters that forms a search pattern). By the way, Kindle’s Mobi format is almost the same as an ePub, so creating a perfect ePub with Sigil results in a perfect Mobi for Amazon’s Kindle. E-books should have totally clean HTML. What do I mean by that? I mean that there should be no font, color, text size or line height specified – hardly any styling, in fact. This is because e-books are completely accessible – the reader chooses the font, the color and the size of the text they want to read. And that’s the way they should be. You see? Very simple. This is how the above should be created in Microsoft Word. Notice the <h1> is created by the Heading 1 style, the <h2> is created by the Heading 2 style and the <p> is created by the Normal style. In order to get the Microsoft Word styles, click the Home tab to display the “ribbon” with all the basic formatting on it, you’ll be able to assign styles there by clicking buttons with text selected. If you open up Sigil after installing it, it will immediately open up a “bare” ePub file (see below). 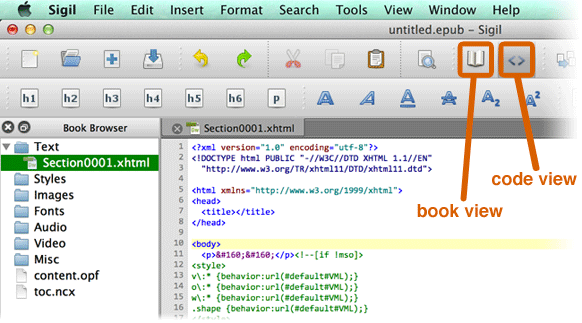 The above image shows a new ePub in Sigil with a Word document pasted in “Book view” and then switched to “Code view”. As you can see in the left hand pane, Sigil has created all the necessary files and folders for the ePub to successfully validate (and create an awesome Kindle Mobi). You really don’t have to know about how all this works as Sigil has it covered. You do, however, have to sort out the text and images in your e-book. After this, you should go straight into the <h1> of your first heading. There will be a bunch of crap in green that you’ll need to manually delete. You’ll then need to clean up the HTML further. All the styles, spans, classes, divs, etc., have to go. Even in a 10,000 word book this seems like a huge task but you can do it in a few minutes by using Regular Expressions. I owe a huge debt to Peter Clough of Get Publishing and the London Kindlers Meetup Group for putting me onto this. 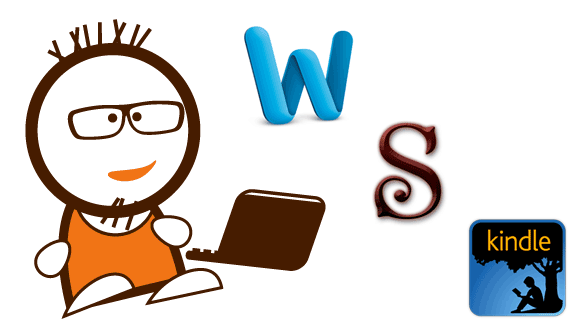 The above video shows you how I do the HTML cleaning and ePub creation in Sigil. The above will get rid of 90% of the rubbish Word puts in your lovely ePub. You can weed out more unwanted HTML by scrolling through and using Sigil’s excellent validation tool. If you have images in your book import them in Sigil (Insert > File, Cmd/Ctrl-I) and write the alt text. Images in Kindles should can be GIF, JPG or PNG, about 500 pixels wide and as small as possible. Import an image in a new paragraph (so after you’ve hit return). Don’t bother trying to flow text around an image. If you want image to be thumbnail size (a headshot, for example) then add a 300 pixel wide white background to the right of your 200 pixel wide image, for example. Credit for this idea goes to ‘Chris_Mac_Artworker’. Later on we will add a 100% width rule in the CSS to make sure your images fill the width of whatever device your book is being read on. Kindle Mobi files should, ideally, have two Tables of Contents (TOCs). One TOC is visible when you tap the Menu button on your Kindle reading device. To create this TOC go Tools > Table of Contents > Generate Table of Contents… assuming that all your chapter titles are h1‘s, you can choose “Up to level 1” in the drop-down. Additionally, many non-fiction authors like to add a TOC as an extra page at the beginning of the book. To do this go TOC go Tools > Table of Contents > Create HTML Table of Contents. Thank you to my Facebook friend, Hynek Palatin, for help with the above. I met Hynek on Pat’s First Kindle Book which is the best online self-publishing group in the whole world – no arguments! The first rule ensures images stretch or squeeze to 100% of the width of the device the e-book is being read on. The second rule ensures that every chapter starts on a new page (assuming that all your chapter titles are h1‘s). … making sure that you have the correct name of the CSS file. As I mentioned before, there is a Validation button in Sigil (a large green checkmark at the top right) that lists out the issues. You can arrive at the problem line of the relevant file by double-clicking on the line number. You can then save and view your ePub in Calibre and Kindle Previewer (both free). The file format for Amazon’s Kindle is Mobi. 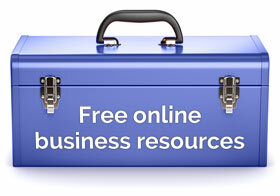 A Mobi is created when you upload a Word doc at kdp.amazon.com. Personally, I upload the ePub here because I think their conversion is fine. However, some people advocate using Calibre to convert from ePub to Mobi before uploading. In the above video I upload a Word document as I go through the publishing process at kdp.amazon.com. But, instead of uploading a Word file, you can upload your perfect, clean, beautiful ePub. The most important thing is to not let these formatting and publishing quirks deflect you from writing a great book. If you are a new author just starting out, my advice to you is to just write that damn book and forget about all this geekery. 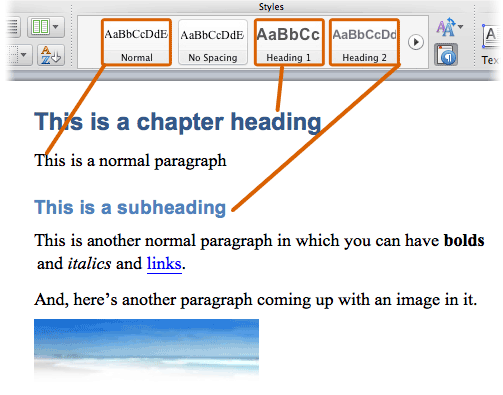 In Microsoft Word, use the Heading 1, Heading 2 and Normal styles when necessary and write! Uploading a Word file at kdp.amazon.com is not the worse thing you can do. It won’t look that bad. If, like me, you’ve published a few Kindles and you’re exasperated that your text is not looking in a certain way, then I hope this helps. Let me know in the comments. Either way, it’s still a confusing process to explain to someone without any HTML experience. Thanks for you feedback on Sigil, Lis, let’s keep our eyes on this one. Great tutorial and I am keen to try it out. However, I just read your response to Lis and I am a PC user. Will I have to upload my finished work to Kindle before knowing if it’s dodgy? I’m not going to convert to a Mac (ha!) and I am loathe to learn HTML unless I absolutely have to, so this approach of using Sigl seemed like a gift! Hi Bobby, I don’t know what the problem with PCs and Sigil is but I think it crashes often. I don’t think it creates dodgy ePubs. But I don’t know. Best of luck and ask questions here if you have trouble.